Of course it figures I was missing the book before this one, so that this one starts with a freaking DEATH. Yep, missed something. Anyway, another good and enjoyable Exiles. There are two lengthy stories and one short at the end that stands out as bizarre. It's not the best offering of the group, but it was enjoyable. There's a new blonde chick who I dislike - too abrasive.The first story is lengthy and so-so, Morph being the best thing about it as usual with funny lines but not used nearly enough.The second features Wolverine and a crossover with the modern day, in our world, X-Men. I have to wonder about the art with the "tucked tail" werewolves. There is a moral to the story that's more obvious and simple than most of the previous stories. That doesn't quite work to fit into the theme, but it was interesting enough.The third is a bizarre and creepy little thing. Completely different kind of artwork, very cartoonish, but I liked the style for some reason. I also thought the short tale was intriguing. Nothing complex about it and it was certainly shorter than the rest, but the dark tones and throwbacks made it enjoyable. Super-heroes (primarily Mutants) forced to bounce through time to fix broken timelines at the whim of one called the Timebroker, hoping that someday their reality will be fixed sufficiently so that they can return to their time and place.They are the Exiles, created by Super-Scribe Judd Winick!But what happens when, 25 issues later, Chuck Austen takes over?As Chuck takes over, with mediocre art by Clayton Henry and Mark Morales, the Exiles are forced to take their first (shown) step into the darker side of reality-hopping, namely allowing all of Japan to die at the hands of a supervillain. This creates dissention in the ranks and ultimately a splitting of the team into three groups, one to confront the villain, one to help the victims, and one to find the "Avengers", a sub-set of Heroes for Hire. 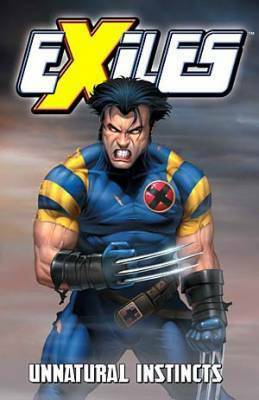 Things do not go as planned--or do they?--and one member of the team is thought to be a traitor in the ranks.Before they have time to blink, they're on "our" earth, meeting up with "our" X-Men, to kill an Alex Summers that is the ultimate in evil. Naturally, there is plenty of brawling, along with in-continuity storytelling that's totally lost on me. Nocturne, the daughter of Nightcrawler, is reunited with one version of her father, and after resolving the reality, they are able to take a little break. The idea is pretty weak, and the showhorning of the Exiles into our universe is neither clever nor useful. I can only assume it was done to help sales on a non-core X-book.THere is also a really useless short story with an abused Peter Parker, a bestial Wolverine, and really, really bad art. I wish I hadn't read it. I don't advise that you do.All in all, the fun of visiting alternative realities without the benefit of "What If...?" is still there, but the irony of Winick's pairings over the first two years is lost on Austen, who seems hell-bent on beating us over the heat with them.Trebby's Take: Read Volumes 1-4 first, but definitely stick with it. The idea is just so damned cool that it would take a total hack--Howard Mackie, for instance--to screw it up. Recommended! Trudging along with the '17 x-read...So Judd Winick is off of the book that has probably been my favorite of this journey so far. And he is replaced with one of my least favorite authors from the x-books so far.I will say that Austen didn't manage to completely ignore the existing character traits for all of the Exiles the way he did when he took over the X-men book. So that's a better start. I'll keep an open mind if only for that. Still, I miss Winick. He just had a way with these characters that just wasn't quite there anymore. This lost just a tiny bit of its charm, for me. It could be the new writer, but I really think that the roster change from the last volume that carried over for this one left the team in a kind of transition that I'm not digging as much as I need to in order to love it the way I did the previous volumes.The art was nice and the arcs were interesting. It wasn't at all a bad book.It just wasn't quite up to my expectations based on the first few volumes. Boy, does this era of X-Men feel dated! If I were rating this on the writing alone, it would get a one star rating. On the art alone it would rate a five. So I give it a three.Sometimes people are given the chance to work on comic books and you wonder why they were ever chosen. Chuck Austen is one of those people. Seriously, his writing is awful. They interviewed him for some extras on the second X-Men movie DVD. He claimed that Nightcrawler has two penises. And they paid this guy to write comic books. Clayton Henry, on the other hand, kept me interested in the Exiles. His art is amazing. The lines are clean and expressive. I love his art. I only wish he would have had the opportunity to work with a better writer. Ugh. New writer and immediate quality issues. The Exiles take an unnecessary step towards dark and gritty. "Kill these people" as a mission. It just didn't fit with where the book was coming from.The Lobo story went on for too long. I don't think I ever read anything with any of the main characters so I was a little lost. Not too much, but I was in no way invested. A low point on the Exiles totem pole, as new writer Chuck Austen drags the team into the main Marvel universe to play crossover. The team is introduced to a vicious Magik, must help Austen's X-Men take down a possessed Havok, and get a little redemption in a stand alon X-Men Unlimited tale featuring the classic crew. Horrible mutant werewolves aside, things get better in the next collection. The Exiles without Blink is still a team I have to adjust to - this set did a good job of helping each character begin to stand on their own. Except Morph, he doesn't change. Vampires and current xmen, this is quite a fun volume. But it takes a while to get to like the new dynamic in the Exiles team. A little too much of a crossover (for comics I didn't read) than a kind of What If? story drawing on Marvel continuity in general. Chuck Austen Clayton Henry Mark Morales - Chuck Austen (born Chuck Beckum) is an American humor novelist, comic book writer and artist, TV writer and animator. In comics, he is known for his work on X-Men, War Machine, Elektra, and Action Comics, and in television, he is known for co-creating the animated TV series Tripping the Rift.In his most recent prose novels, Chuck Austen has been going by the name Charles Austen.